Great news! The new and improved Westerbork telescope in the northeast of the Netherlands has seen first light! If you are into radio astronomy, or if you have visited the second world war nazi camp and monument at Westerbork, you may be familiar with this instrument, which was built in 1970. The telescope is situated right next to the former transit camp. During the Second World War, Romani and Dutch Jews were assembled there, for transport to other Nazi concentration camps. The famous Anne Frank (from the diary) was kept here for a while. 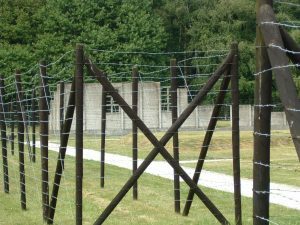 A rebuilt barrack at Dutch Nazi camp Westerbork. Anne Frank stayed in this barrack from August till early September 1944, before she was taken to Auschwitz and then Bergen-Belsen. Picture from Wikipedia, courtesy Blacknight. 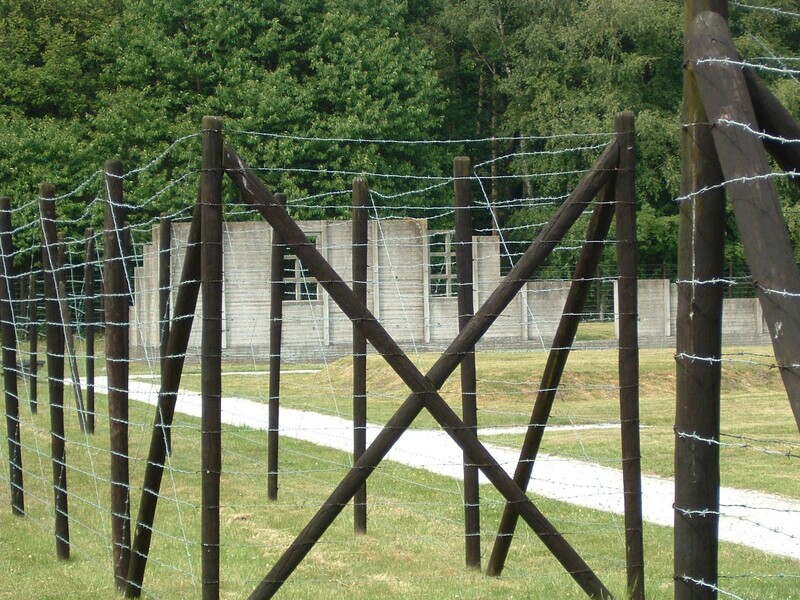 Today, you can visit the remains of the camp, which now is a monument. From the site, you can see the telescope, or actually telescopes, because the instrument consists of 14 separate dishes, 25 meters in diameter each. The total distance between the dishes is 2.7 kilometers, or 1.7 miles if you insist on using archaic units. The telescope actually is pretty old already. In fact, it is older than I am (I was built in ‘75). Nevertheless, this instrument has helped doing great science, and has led to many remarkable discoveries. 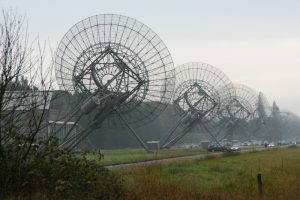 The Westerbork synthesis radio telescope. And typical Dutch weather 🙂 Picture made by me on a day the telescope was open for the public. Normally, cars are not allowed here, because they cause interference. Of course, technology does not stand still, and modern, more sensitive instruments were developed and built during the four decades (!) that this telescope has been operational. So, the beast was becoming a bit old and grumpy. Not to worry! We are Dutch, and don’t like to waste anything (some say we are cheapskates). So, recently, the receivers that are in the focal points of the dishes were upgraded with brand new ones. 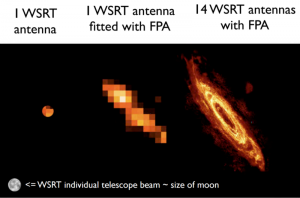 Originally, each dish contained only a single sensor, basically producing a single pixel. 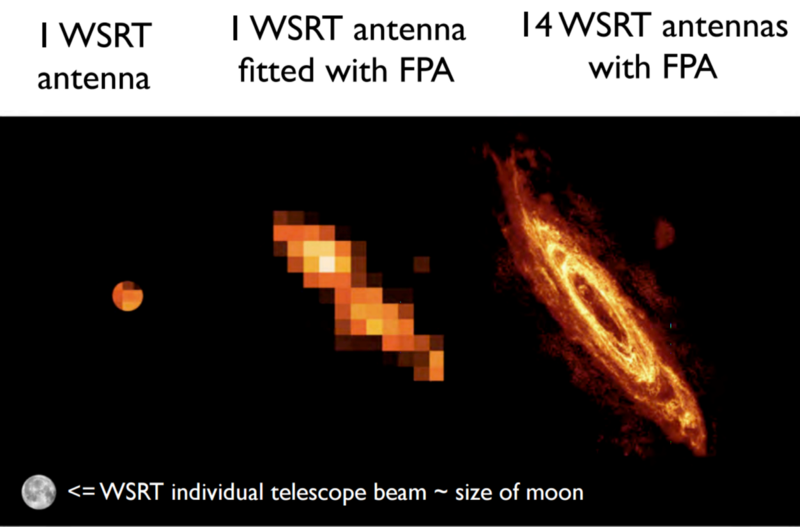 The new receiver, called APERTIF, actually is an array of sensors, called a Focal Plane Array (FPA). Compare it to a modern sensor in a camera, which produces several megapixels at once. So, this gives us more sensitivity, but especially a much larger window on the sky. We can see more at the same time. This is important if you want to make a survey, searching for objects that you don’t know yet, or which appear suddenly (like supernovae, pulsars, or signals from little green men). Focal Plane arrays rock! Picture courtesy ASTRON. So, why am I blogging about this? Well because it is cool, duh! And, because we at the Netherlands eScience Center develop software to process the data generated by this instrument. To be more precise, we are working on ARTS, the APERTIF radio transient system. We will, for instance, observe pulsars: neutron stars that are spinning quickly, emitting a beam like a light house. For some pulsars, the time between pulses is so constant that they are even more precise than an atomic clock! Pulsars are important for many reasons. One of them is that we hope to use them to detect gravitational waves, learning more about how the universe works. It is a privilege for us to write software that will help make these scientific discoveries happen! At the same time, it is a strange but beautiful thing that a site where so many bad things happened to so many people in the past now is one of the pinnacles of science.